Size: 6ft 0in x 4ft 4in (182 x 132cm). 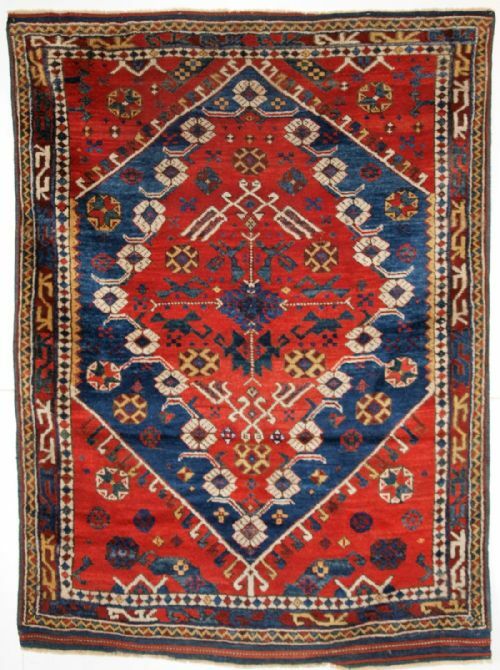 Antique Turkish Bergama rug of classic design with superb colour. The rug has very soft wool and a very floppy handle. The rug is in excellent condition with slight wear and good pile. The rug has been hand washed and is ready for use or display. The rug is suitable for light domestic use. Size: 5ft 11in x 3ft 11in (180 x 120cm). 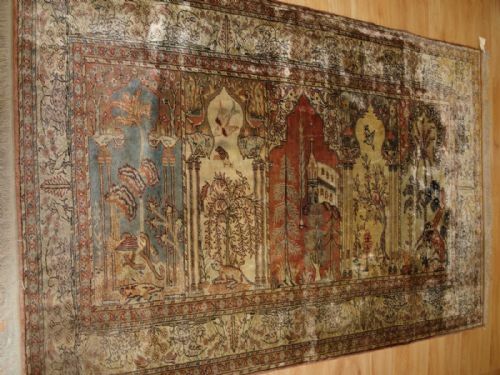 Antique Anatolian Kayseri 'art silk' saf prayer rug, beautifully drawn with prayer niches containing trees, birds and animals. A very silky rug almost impossible to photograph due to the shine. Outstanding drawing and design with wonderful old colours. Size: 2ft 3in x 2ft 1in (69 x 63cm). 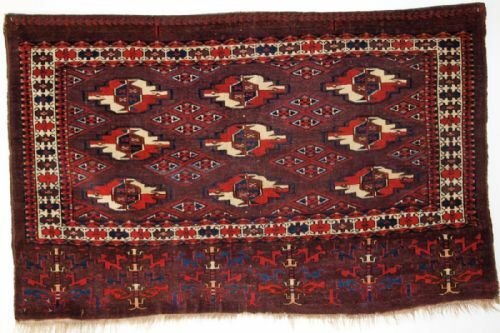 Antique Persian tribal Qashqai bag face of fine weave and good colour. The bag face is very well drawn with a central hooked medallion, surrounded by floral rosettes with smaller hooked medallions to each corner. 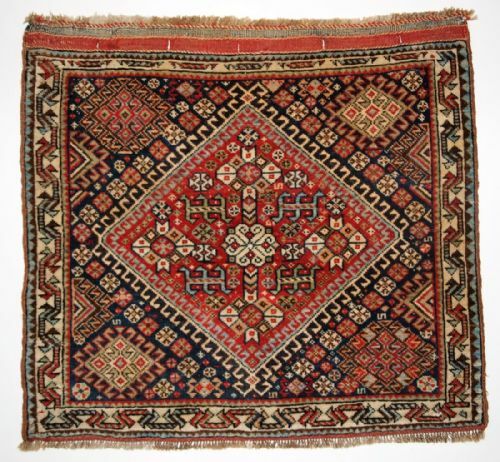 The design is classic Qashqai, with a very well drawn traditional border. The closing lapets are still in place at the top. The bag face is in excellent condition with very slight even wear and full pile. The wool is very soft and the bag face has a floppy handle. The bag face has been hand washed and is ready for display. Size: 13ft 4in x 9ft 4in (405 x 283cm). 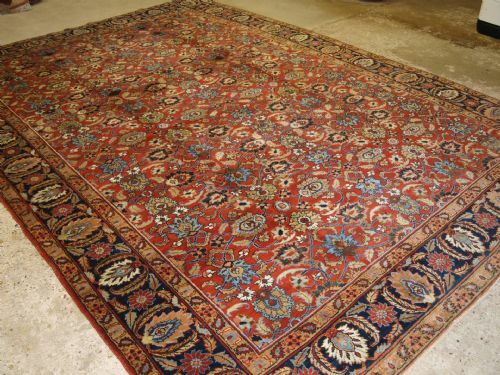 Antique Tabriz carpet of large size with all over design, the carpet has a soft terracotta red ground with a floral design in pastel shades. The border is an outstanding feature of this carpet. The carpet is in excellent condition with very slight wear and good pile. The carpet is suitable for normal domestic use such as a dining room or a living room. Size: 3ft 11in x 2ft 6in (120 x 75cm). 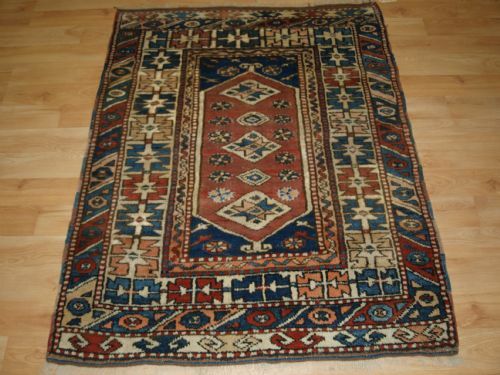 Antique Yomut Turkmen 9 gul chuval with superb rich colour. Note the well drawn 'bat' border. The elem design is really outstanding.